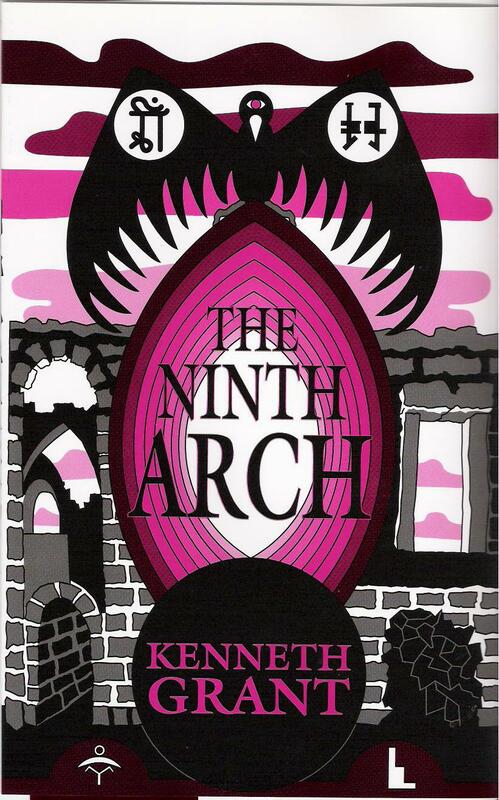 The Ninth Arch by Kenneth Grant. The Ninth Arch is the final volume of the Typhonian Trilogies. It comprises an extended analysis of and commentary upon Liber OKBISh, The Book of the Spider, a transmitted text which was received in the course of the Workings of New Isis Lodge in the 1950s. Grant’s novella Against the Light (Starfire Publishing, London; 1997, 2016) casts some of the themes of Liber OKBISh into fictional form. A brief account of the background to Liber OKBISh can be found here. New Isis Lodge was the final name given to a magical group developed by Kenneth and Steffi Grant over several years in the late 1940s and early 1950s. The main body of work by New Isis Lodge extended over the years 1955 to 1962, and it was on the basis of his experiences within this Lodge that Grant was later to publish his monumental series of nine volumes which has come to be known collectively as the Typhonian Trilogies. Including several O.T.O. members from Crowley’s day, an insight into some of their methods is given in Hecate’s Fountain (Skoob Books Publishing, London, 1992; Starfire Publishing, London, 2014). Another transmitted text, the Wisdom of S’lba, together with several chapters of commentary amd analysis, is published in Outer Gateways (Skoob Books Publishing, London, 1994; Starfire Publishing, London, 2015). The Ninth Arch, comprising the Book of the Spider (OKBISh), is the final volume of a series of Trilogies which trace the emergence into historic times of an ancient body of occult doctrine known as the Typhonian Tradition. In order fully to understand its purpose and content, The Ninth Arch should be scanned against the background of the larger canvas on which it is painted. Such an approach will facilitate insight into the Oracles of OKBISh and their accompanying comments. As an additional aid to focussing salient features of the Tradition, the author's Nightside Narrative, Against the Light (Starfire Publishing, 2016), should serve as a helpful and explanatory ‘footnote’ to the circumstances existing at the time OKBISh was ‘received’. The Oracles were communicated audibly, and occasionally visually, to various members of New Isis Lodge (1955-62) and at certain stages of magical ritual. The Current which generated the material began, sporadically, as early as 1939, with the initial movement of a transmission which developed over the years into the text known as the Wisdom of S’lba (see Outer Gateways, Starfire Publishing, 2015). In 1945, the Wisdom – then in its nascent stage – was recognized by Aleister Crowley as an authentic communication. From that time, the Informing Intelligence went on to complete the Wisdom, and proceeded to produce the massive series of Oracles presented in The Ninth Arch. The mode of reception has been described in the Introduction. The method of documentation confirms beyond cavil the validity of serial qabalah, as used previously in analyses of the Wisdom. The richly complex pattern of magical correspondences, in both cases, has proved of unparalleled value in determining genuine contact with occult forces possessed of Knowledge and Prescience concerning important terrestrial Events. That the pattern reflects direct contact with an indefinitely ancient yet ever new Typhonian Gnosis, is demonstrated by the application of relentless and rigorous qabalistic exegesis, as recorded in the comments. For readers interested in significant relationships between Numerical (physical) and Magico-Mystical (metaphysical) concepts, The Ninth Arch contains an exhaustive thesaurus of the Typhonian Tradition. But beyond considerations of gematria, the Oracles of OKBISh adumbrate Events likely to overtake planet Earth within the lifetime of many of the book's readers; and – for individuals who are able to interpret the Oracles in terms relative to their own magical universe – they issue warnings of the dangers that lie ahead of those unprepared to invoke the Sign of Protection against the oncoming wave of Outer Forces set to assume control of the planet. Now, at the turn of a millenium, it seems appropriate to release this Knowledge. The book is republished in a fresh typesetting, incorporating corrections made by the author in his own copy of the book. Artwork has been rephotographed where possible, and presented in colour where appropriate. 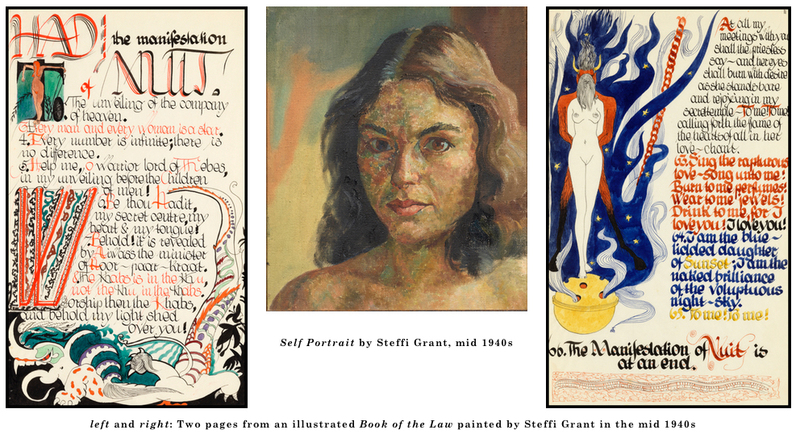 Six of these plates are new for this edition, and are taken from an illuminated calligraphic manuscript of The Book of the Law executed in pen, ink and watercolour by Steffi Grant in the mid 1940s.